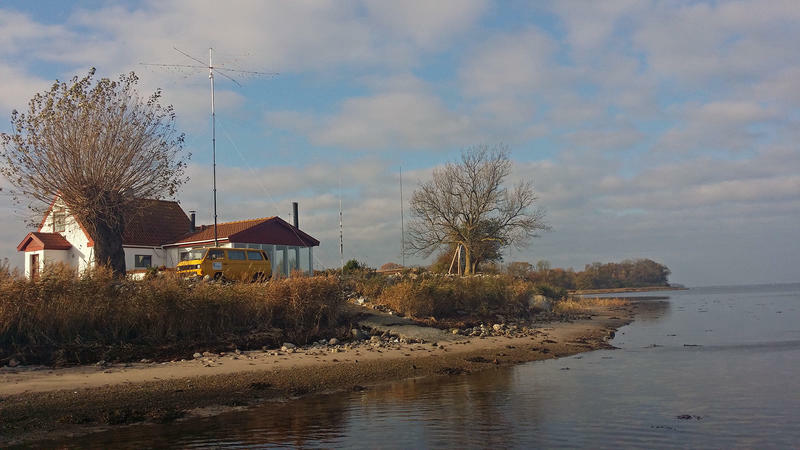 2015 IOTA activity from Lolland Island. November 5th until 14th. Lolland is located in the south part of Denmark. QTH Locator: JO54QV. IOTA Ref. of Lolland Island is:( EU-Ø29 ) - Loc: JO54QV. Operatorteam 2015: Ben - DO1BEN, Georg - DL3YAT, Josef - DF2KK and Vinny - DL6II. Live QRG for the stations was published on QRZ.com. Click OZØIL. A livecam has shown the operator at work. New picture every 20 sec. For cam - click here - . Picture of the operatorteam is available here - pse click - . The wire beam was mounted on the 10 meter crank tower from our old VW-Bus (from former german radio police). The QTH and the antennas are located very close to the Baltic Sea. There is a Lighthouse on the island. World Lighthouse on the air (WLOTA) reference LH 2773. After our good activity in 2014 we decided to go for a "second edition". Andy DL5AND - teammember in 2014 - can not join in 2015. But we welcome Josef - DF2KK - in the 2015 Lolland Team. Pictures are available on Georg webpage. He is our fotograf and well expierenced. Pse click here for pictures on Georg's webpage. 2014 QSL card preview is now availabel here - click for larger pict - . Thanks to all who came back to our cq calls. In the past we run several activities from Lolland Island as OZ/DO1BEN.